We will guide to successful stores with true knowhow and meticulous support. To make our customers feel safe and happy. 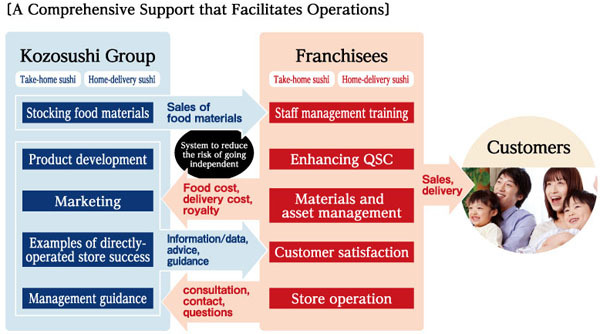 Kozosushi will provide franchises with a thorough support system for smooth store operations. Kozosushi will provide fresh food materials, product development support and marketing information, etc. We will also conduct a thorough cost management and provide knowhow that are unique to Kozosushi. We will aim to develop with stores and franchises with “WIN-WIN relationship” as our watchword.